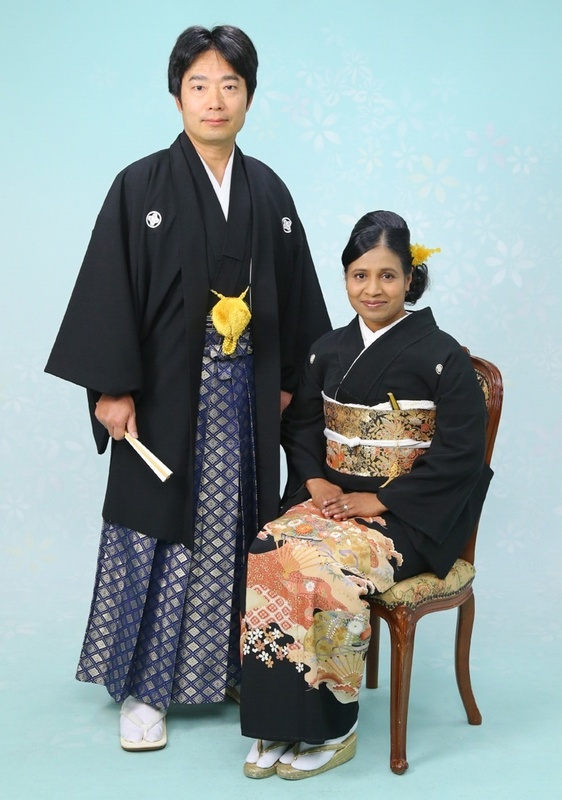 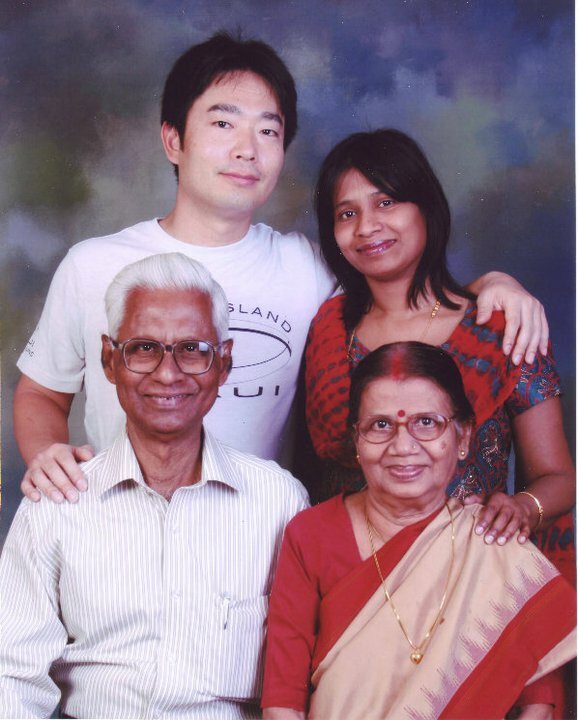 As I have written earlier, hubby and I had been to his home in Ichinomiya City during the Golden Week holidays in the beginning of May. We had been to his home by our car. 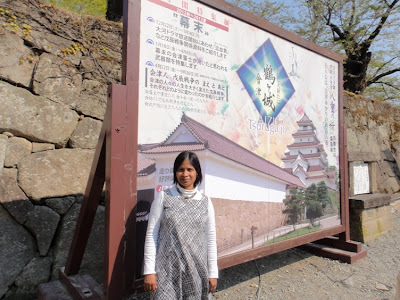 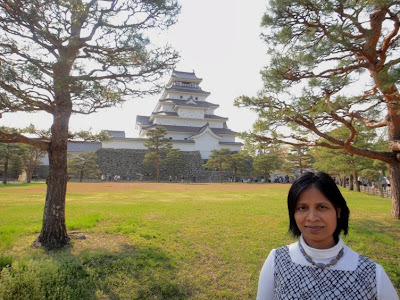 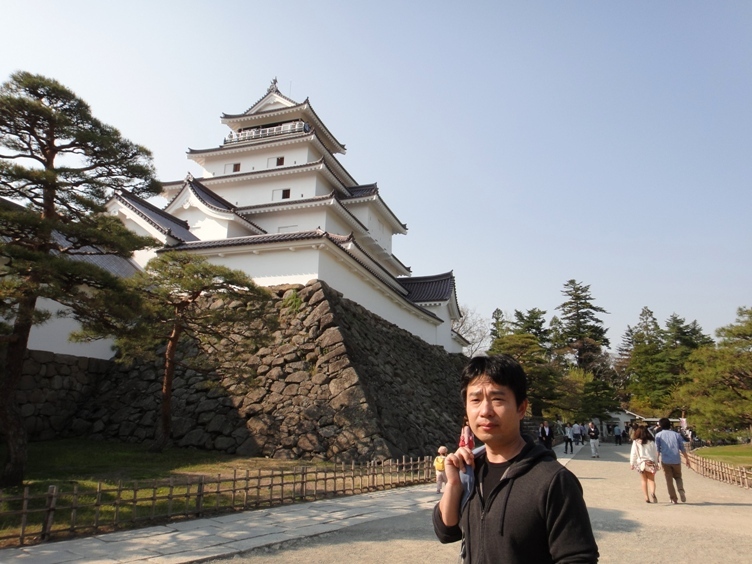 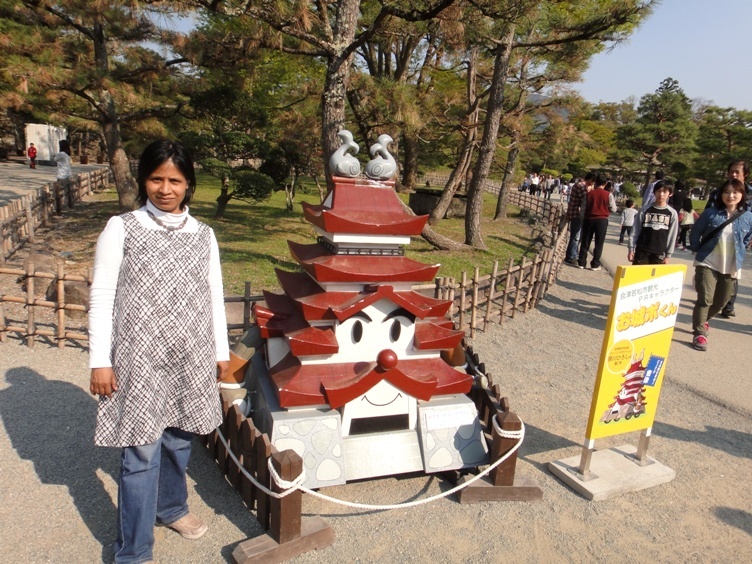 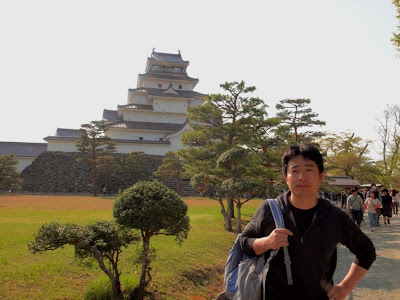 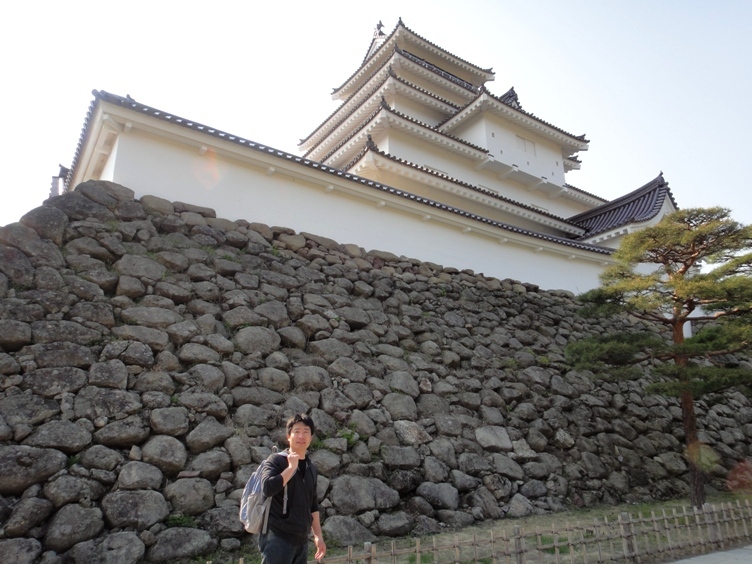 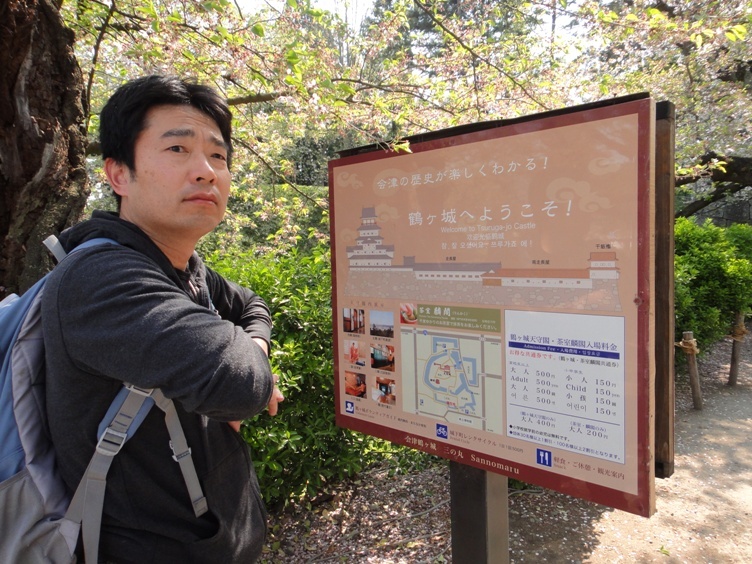 On 5th May, we visited Aizuwakamatsu Castle during our return trip to Akita. Aizuwakamatsu Castle is a concrete reconstructed castle located at the center of Aizuwakamatsu City in Fukushima prefecture. It is a hilltop castle. Aizuwakamatsu Castle was constructed by Ashina Naomori of Ashina clan in 1384, and was originally called Kurokawa Castle. 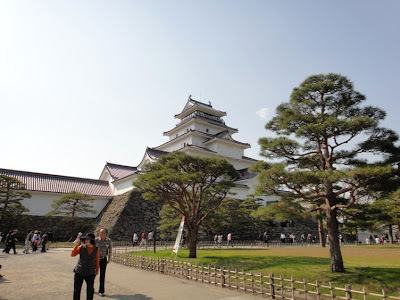 The castle changed hands many times between the different rulers of Aizu region, and was an important military and administrative center of the region until 1868. 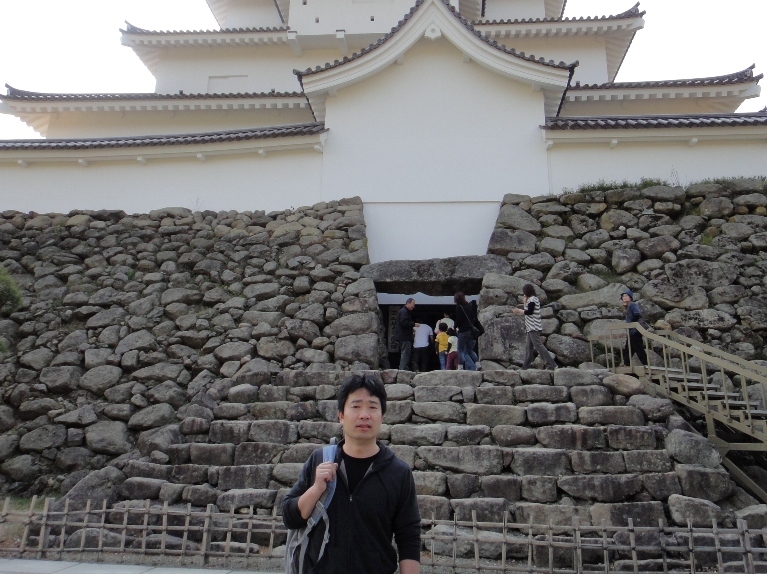 Ashina clan was able to hold on to the castle until 1589, when it was captured by Date Masamune at the Siege of Kurokawa Castle. 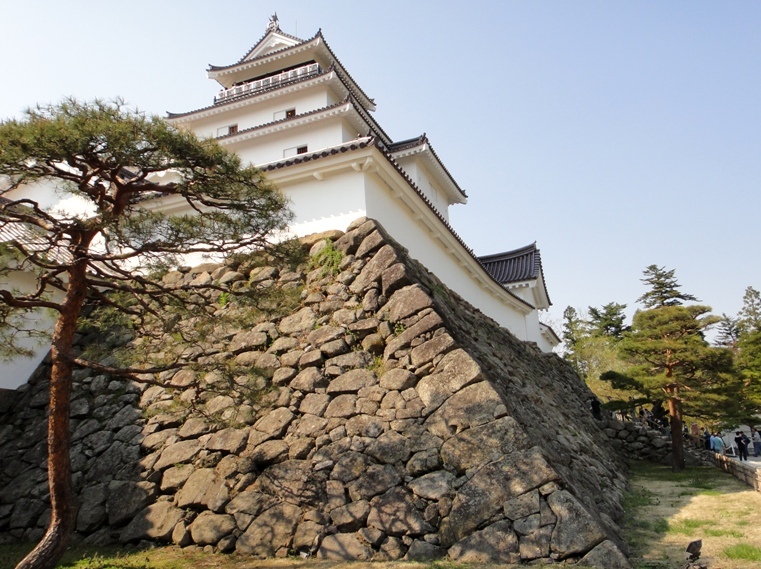 However within a year in 1590, the castle was captured by Toyotomi Hideyoshi, and was awarded to Gamo Ujisato in 1591. Gamo Ujisato undertook massive renovations and redesigned the castle which was completed in 1593. 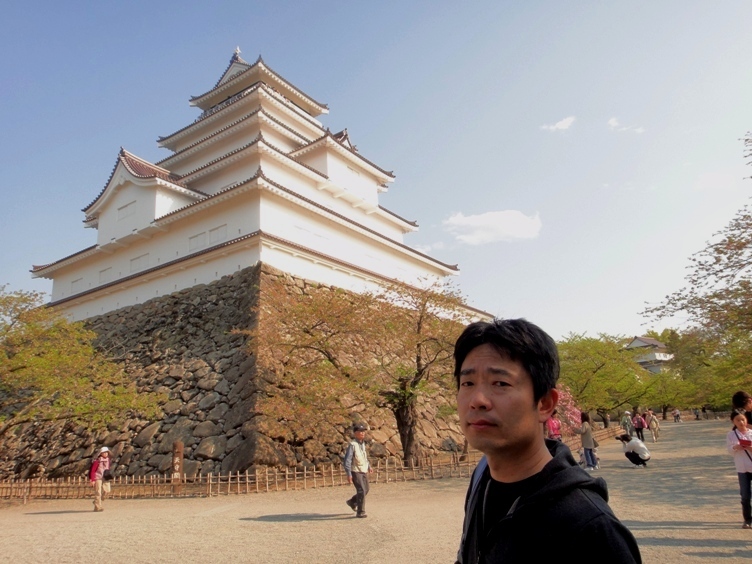 He built a seven-storied castle and renamed it as Tsurugajo Castle. But the castle tower was damaged as a result of a big earthquake in 1611. 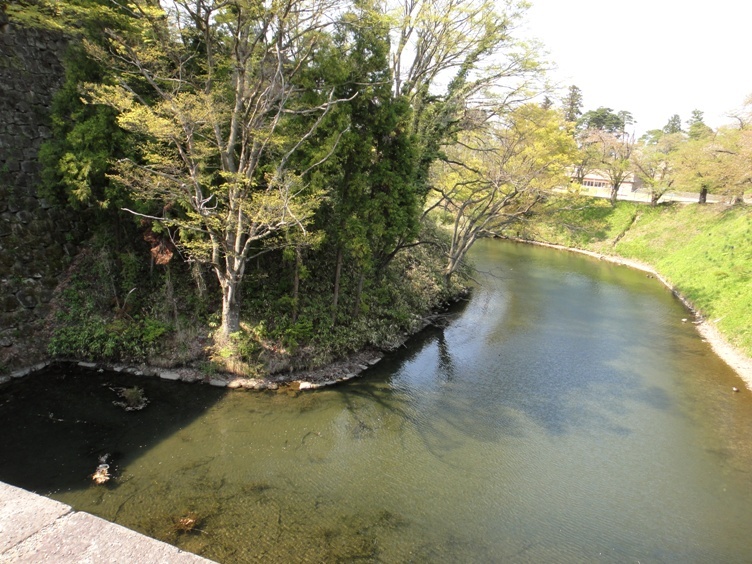 In 1627, Kato Yoshiyaki of Kato clan from Iyo province became the new lord of the region. 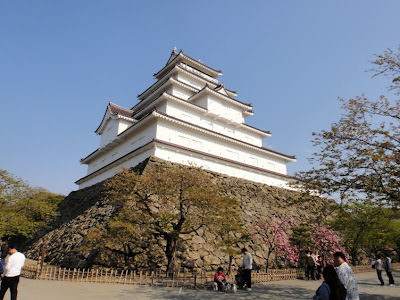 He started the repair of the castle, and the construction of a seven-storied five-leveled castle was completed by his son Kato Akinari in 1639. 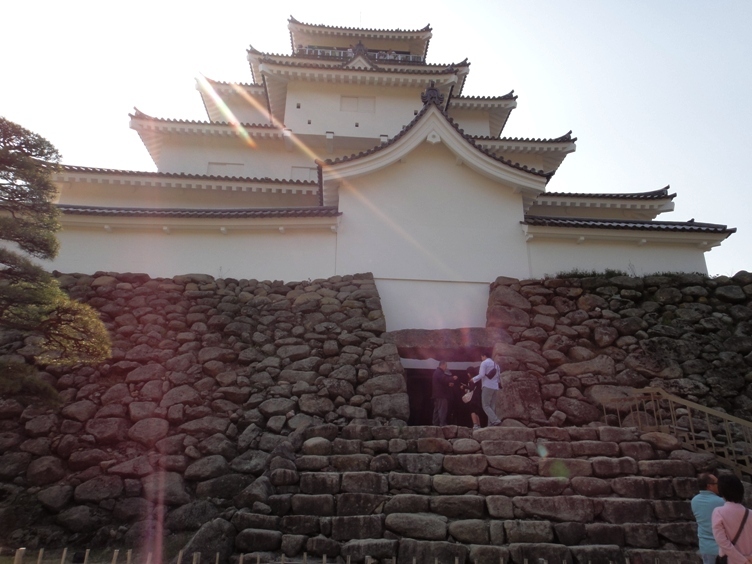 The reconstructed main castle tower we see today is based on the design of the castle tower built by the Kato clan. 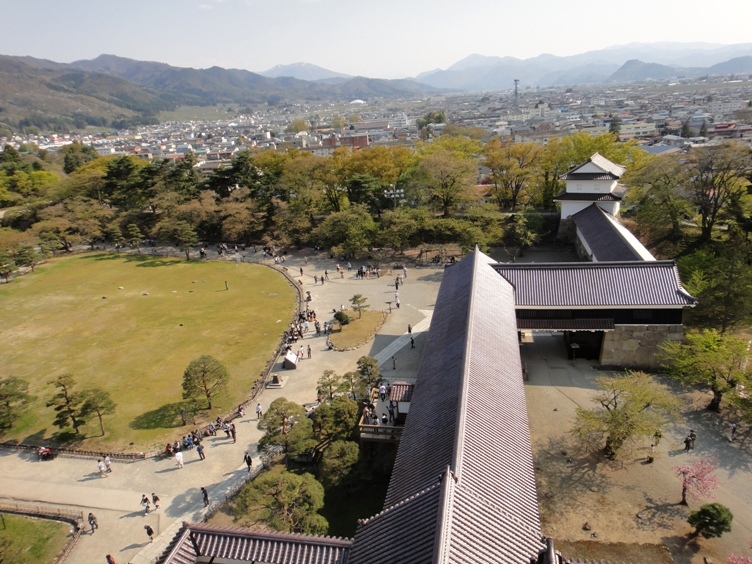 During the Edo period (1600-1867), the castle was the seat of Aizu clan which was founded by Hoshina Masayuki. 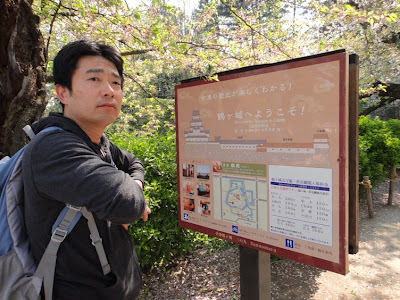 Masayuki was the grandson of Tokugawa Ieyasu of the powerful Tokugawa Shogunate who controlled most of Japan at the time. 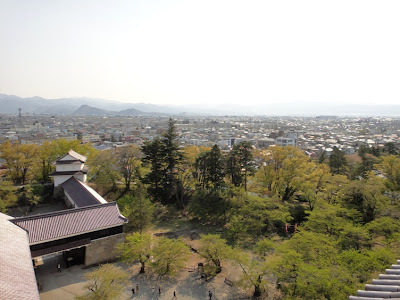 Masayuki and his successors bore the Matsudaira name, and close relations developed between the Aizu clan and the Shogunate. In the mid-19th century, Meiji governmental forces of the newly formed Imperial army started Meiji restoration aimed to overthrow of the Edo Shogunate. As a result, the castle was besieged by the Meiji forces in the Battle of Aizu in 1868 during the Boshin War. The Aizu clan resisted the attacks for a month but was finally defeated, which ended the Edo period samurai era. 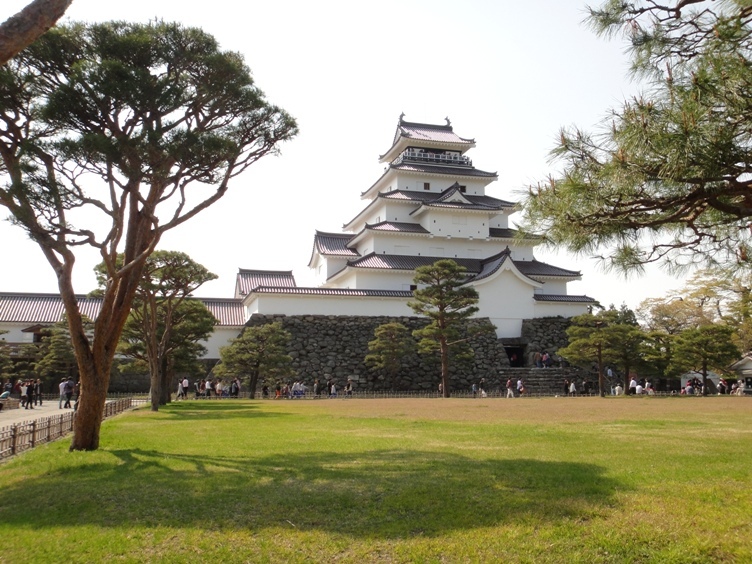 The castle was demolished by the new government in 1874. 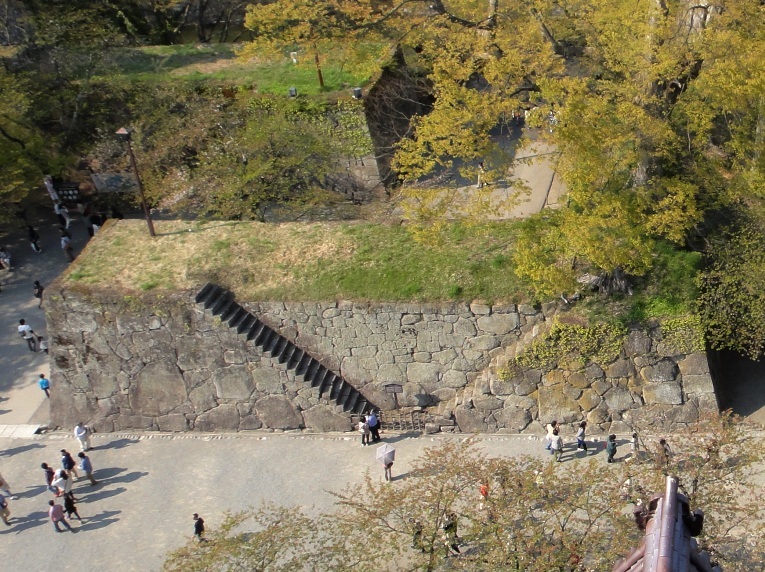 The castle ruins were declared as a national historical site in 1934. The present day seven-storied five-leveled castle tower was reconstructed in 1965 using concrete, and has a height of 36 meters. 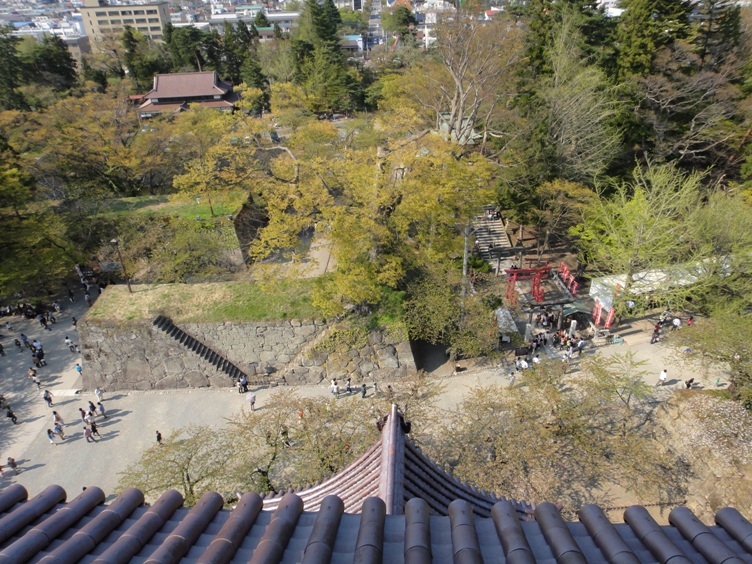 During the renovation works in 2011, the color of the roof tiles was reverted from grey to the original red. 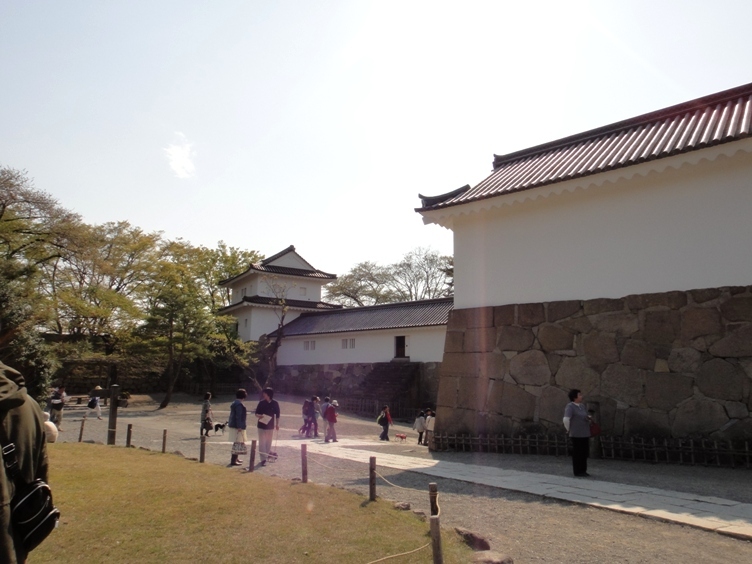 Inside the castle, there is a museum located in the first to the third floors. 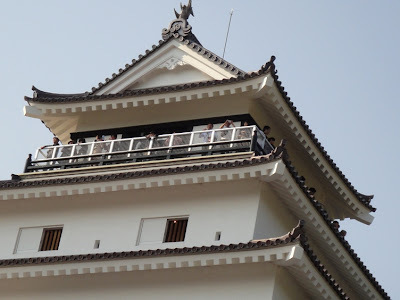 In addition, there is an observation deck at the top floor. 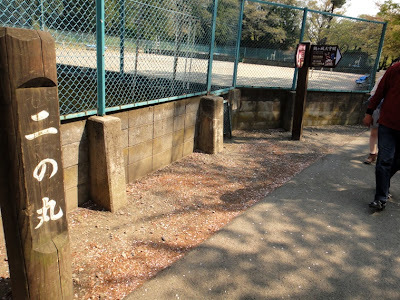 We reached Aizuwakamatsu Castle Park area at about 3 pm. We parked our car near Sannomaru area of the castle located in the northeast corner area of the Castle Park. 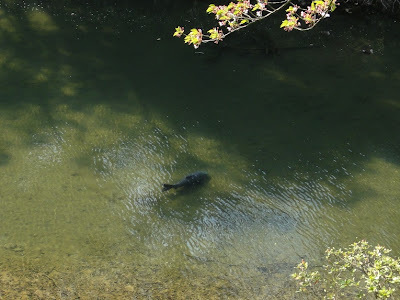 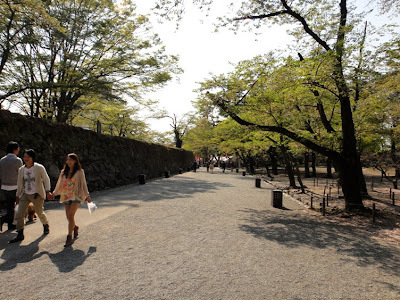 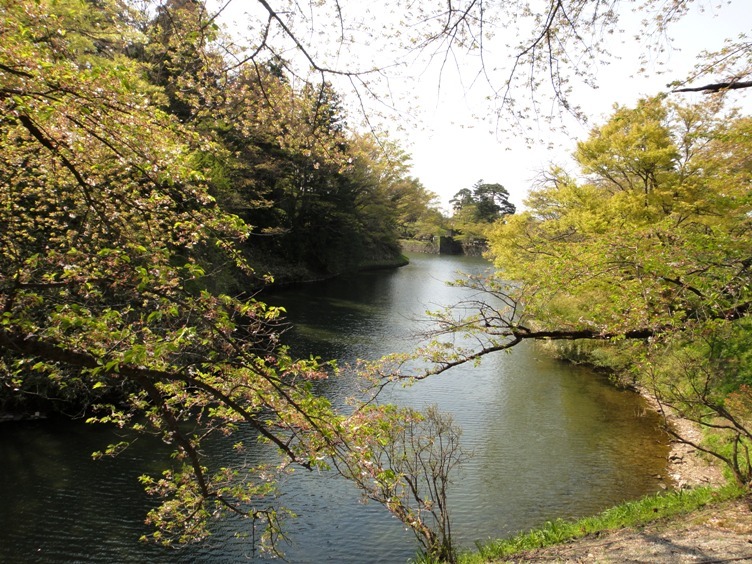 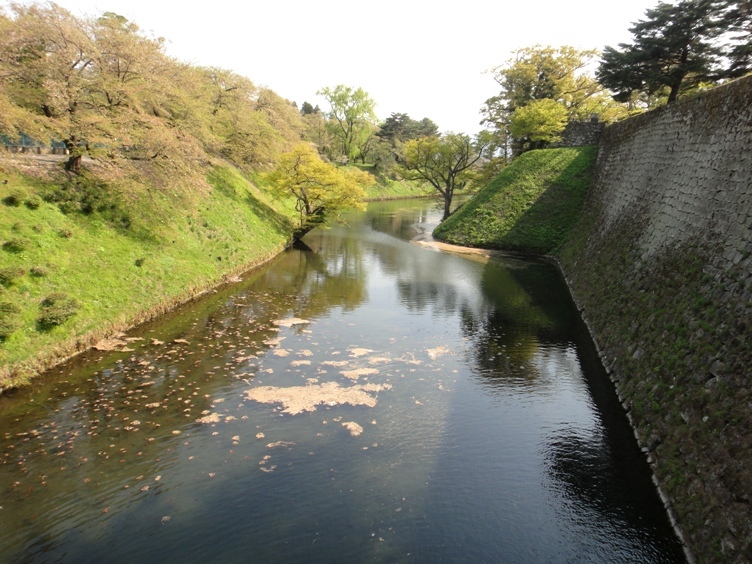 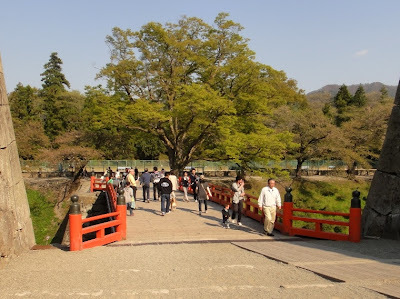 We walked leisurely for about ten minutes towards the central-east area of the Castle Park and saw water-filled inner moat surrounding the central Honmaru area and the great stone walls of the castle to our right side. In addition, we also saw Ninomaru area to our left side. 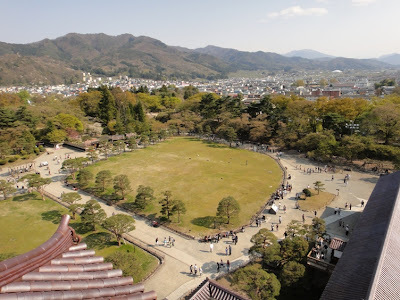 I would like to mention that a typical castle in old times consisted of multiple rings of defense, with the Honmaru ‘main circle’ in the center where the castle tower stood, followed by the Ninomaru ‘second circle’ and Sannomaru ‘third circle’. 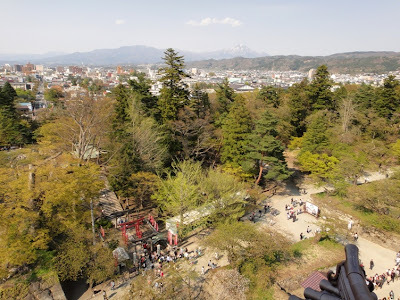 We saw that presently, the Sannomaru and Ninomaru area of the Castle Park did not have any of the old original structures or buildings. Soon we reached a bright red colored bridge name Rokabashi located over the inner water-filled moat, which connects Ninomaru area of the Castle Park to the east side of Honmaru area. 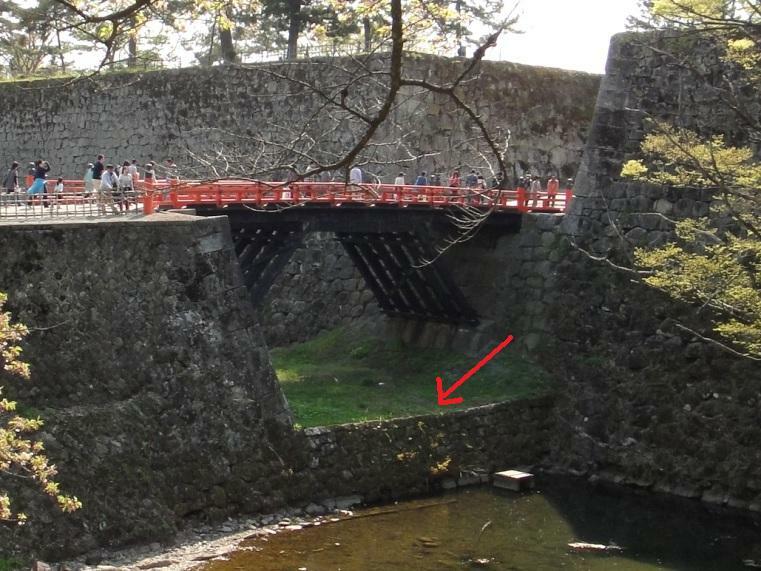 The original bridge had a roof covering over it. The raised stone foundation under the bridge is not actually for the bridge, but it works as a dam to keep water on the other side of the bridge. 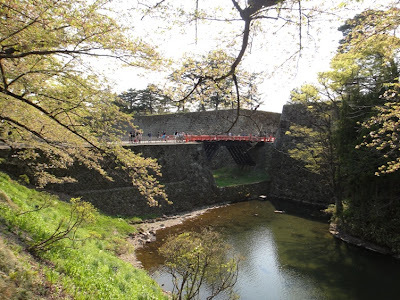 After crossing the bridge, we noted that the high stone walls surrounding the Honmaru area are beautifully built. 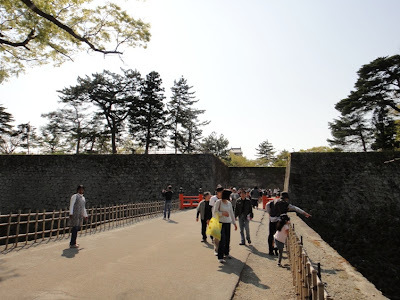 Next, we walked along a paved path in the Honmaru area for about five minutes, and saw the castle main tower to our left side. Near this northern area of the Honmaru, older Omotemon front gate of the castle tower once stood. 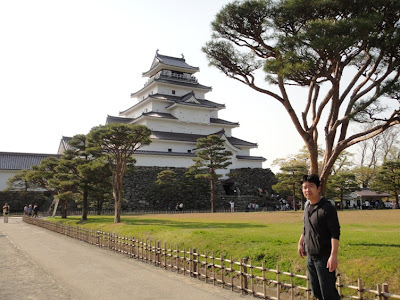 It is a wonderful photo spot and we took a few photos of the castle tower. 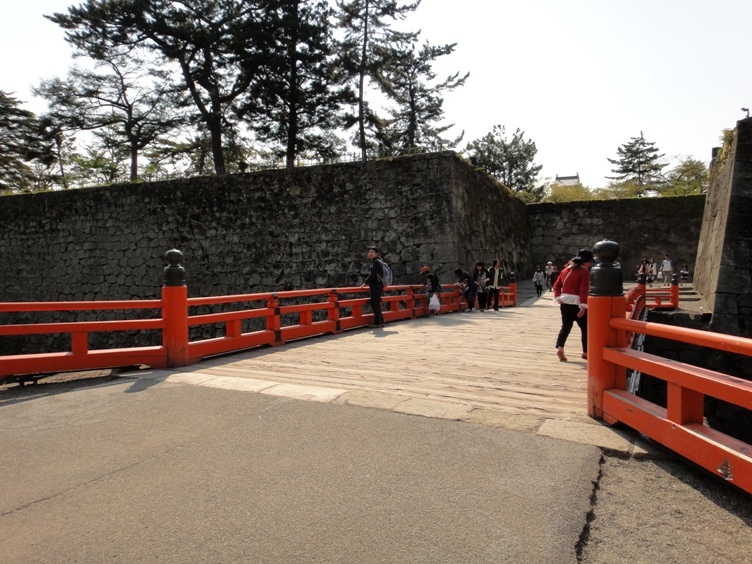 Next to this older front gate area, we saw a huge board that displayed information about a popular NHK television drama series named ‘Yae no Sakura’ which was filmed at this castle and is being telecast this year. 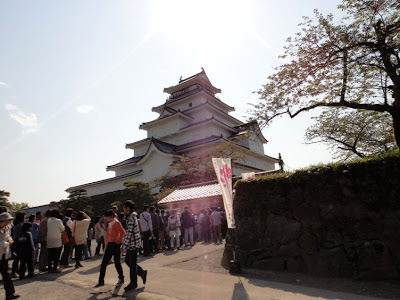 We walked up to the castle main tower and saw a ticket booth counter adjacent to the tower. 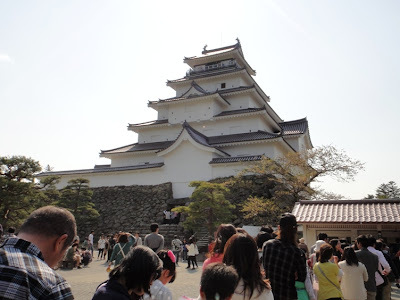 We purchased tickets worth 500 Yen per person as admission fee to enter inside the castle tower. 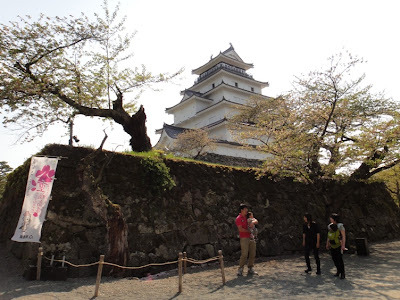 We also saw that the castle’s mascot character named Oshirobo-kun was prominently displayed right in front of the castle tower. 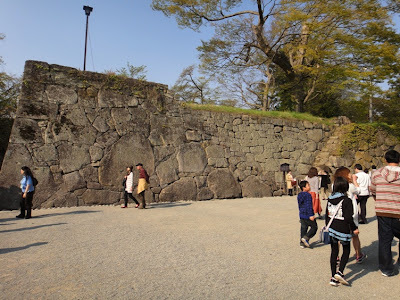 The spot where older Omotemon front gate of the castle tower once stood. 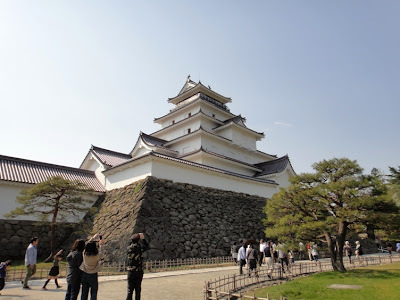 The castle main tower and stone walls look so wonderful. 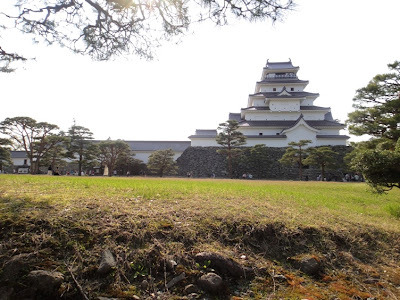 Afterwards we walked around a carefully tended green lawn in Honmaru grounds located right in front of the castle main tower, and viewed the main tower from various positions and angles. The tower looked fantastically wonderful from all the angles. 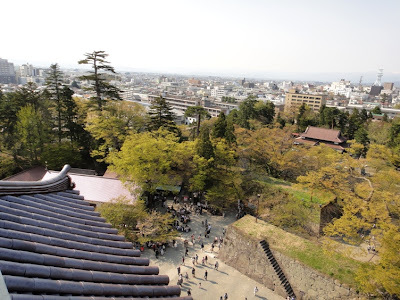 Towards the south of Honmaru area, we saw a reconstructed two-leveled Hoshii-yagura Turret which is connected to the castle main tower via the Minami Hashiri-nagaya Longhouse. Both these structures were reconstructed in 2001. 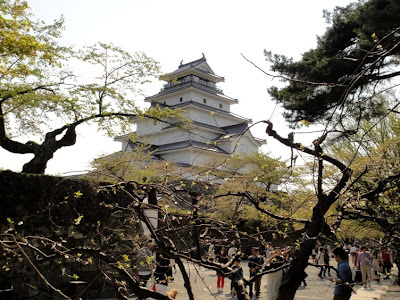 While walking just next to the castle tower, we noted that the shape of the stone base of the tower looked so elegant and magnificent. In addition, the ornamented roofs of various floors of the tower are so striking. 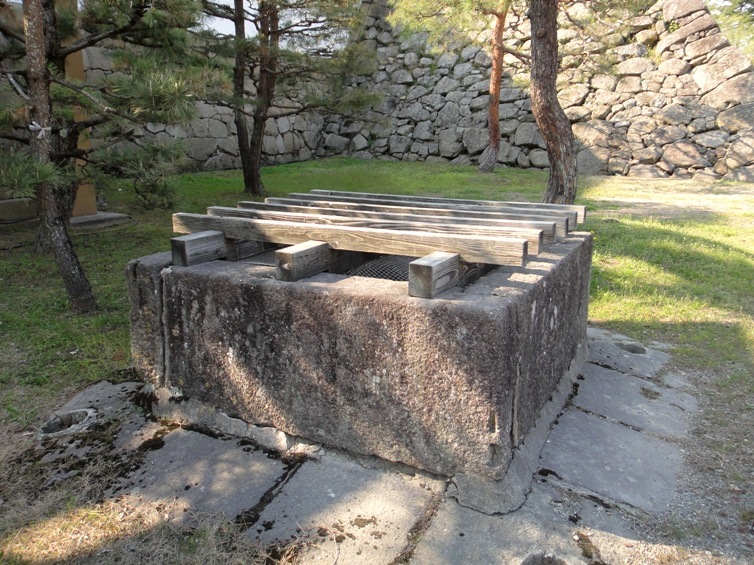 We also saw a well right in front of the castle tower. 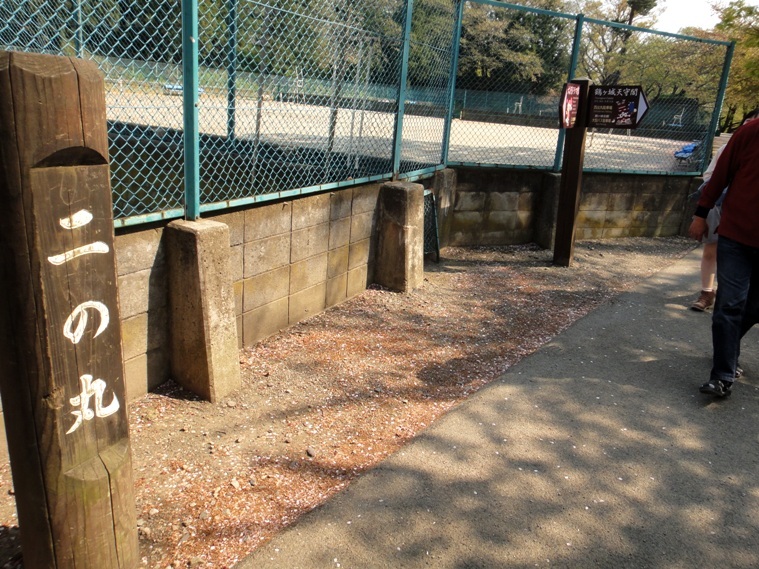 It seems drinking water was very hard to come by in this area, and so the well was very precious. Next we entered inside the castle main tower. 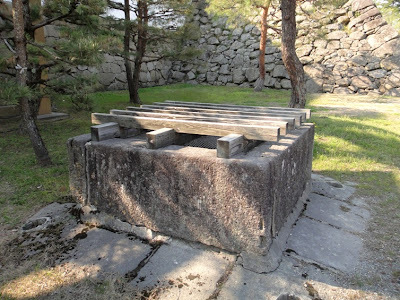 The inside is comprised of seven stories including the basement. 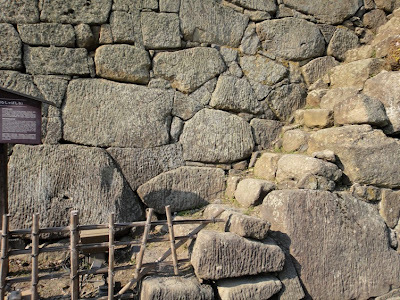 In the old times, the basement was mainly used as a cellar to store salt which was not readily available in this mountainous region. The first to the third floors make up a museum that introduces the feudal lords of the Aizu region, the history of the region, the daily life of Edo period commoners, traditional handcrafts of the region, and gives information about Boshin War. 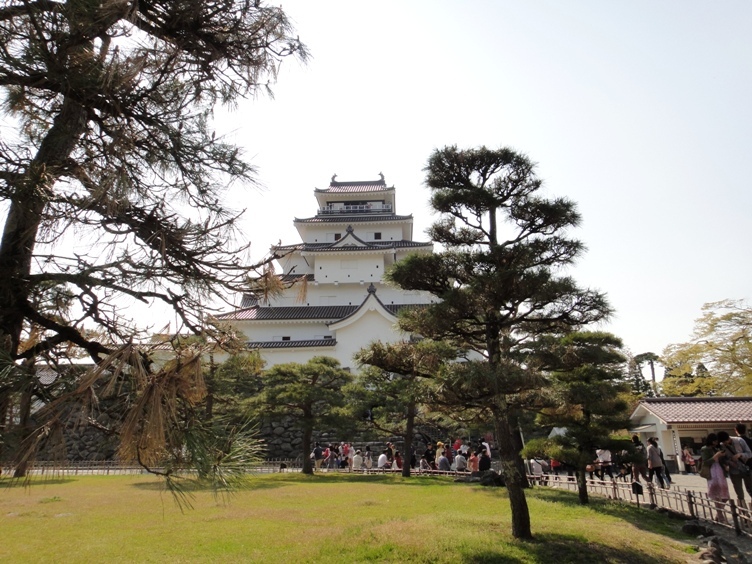 Unfortunately photography is not allowed inside the castle tower, and so we do not have any photos of the museum. 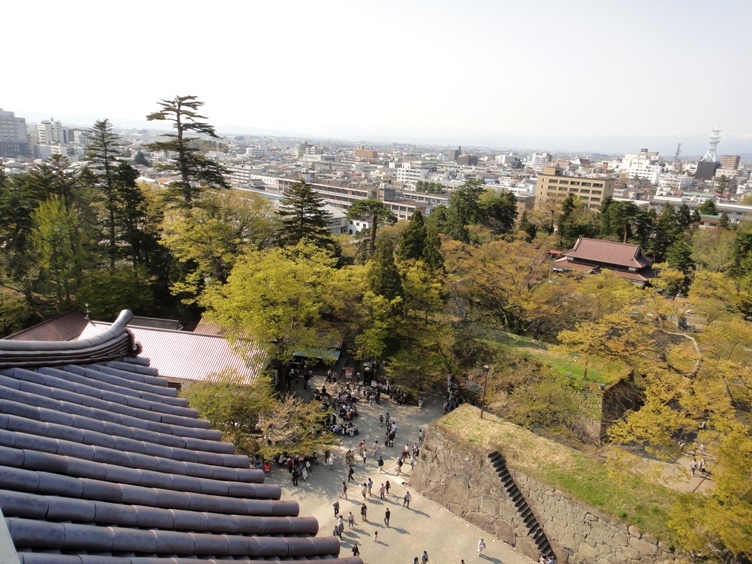 The topmost floor has an observation deck from where we can look out at the castle grounds and Aizu City. From the deck, we saw large well tended lawns in front of the castle tower at the central-east area of the Honmaru grounds. The lawns are oval in shape and formerly buildings stood there during the Edo period. 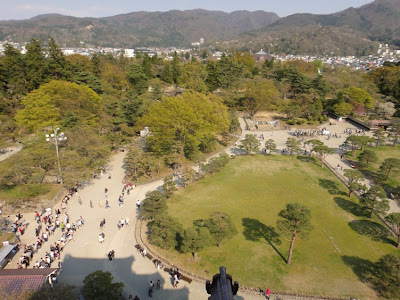 Those buildings were the place where the lord of the area lived and administered the entire area from. 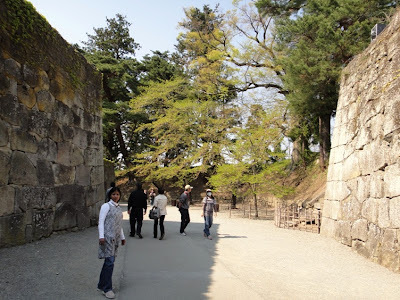 Afterwards we left the inside of the castle main tower and walked towards the back of the tower at the west side of the Honmaru area. The castle tower looked wonderful from this angle also. 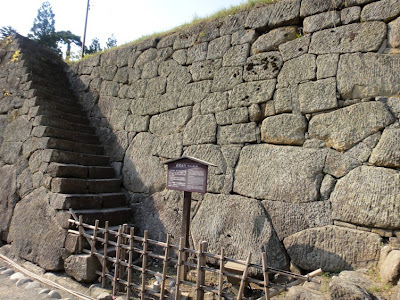 Towards the north side of the Honmaru area, we saw stairs built in a V-shape on the stone walls of the castle. Such stone stairs are called Mushabashiri and is one of the distinguishing features of this castle. 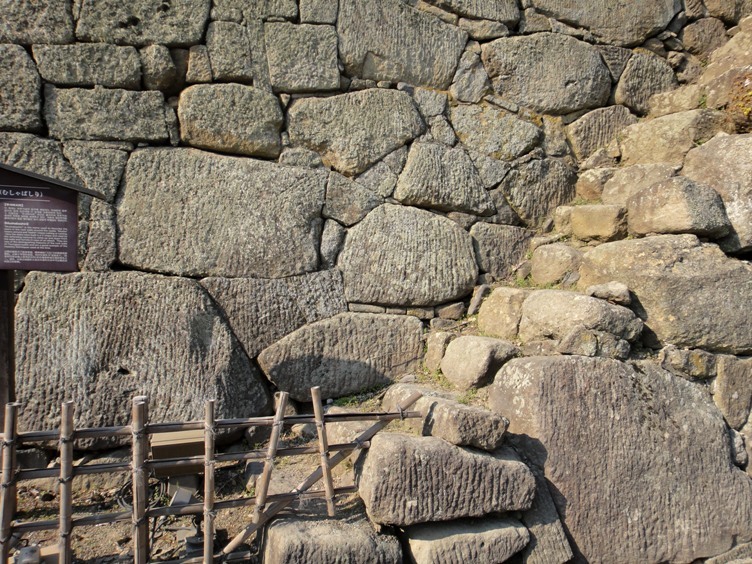 These stairs enabled the warriors to climb up and down the walls and turrets in case of an attack. 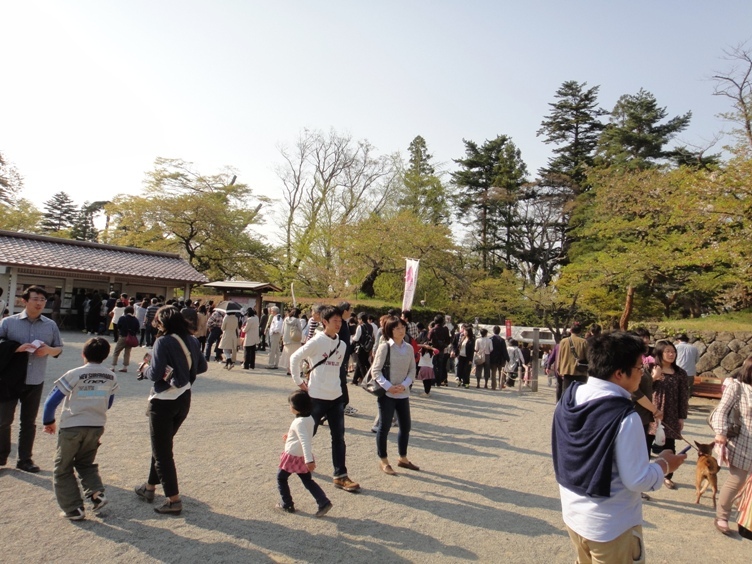 Finally we went to a souvenir shop located at the northwest corner of the Honmaru area and bought a pair of cute Akabeko dolls which are famous traditional handicrafts of Aizu region. 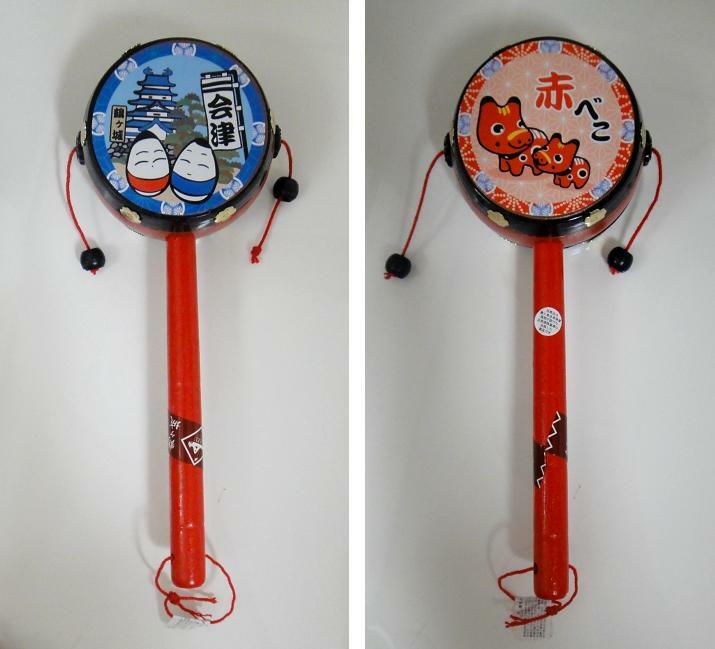 We also bought an adorable Den-den daiko drum. We loved visiting Aizuwakamatsu Castle. We left the castle area at about 5 pm and walked back to the car parking area. 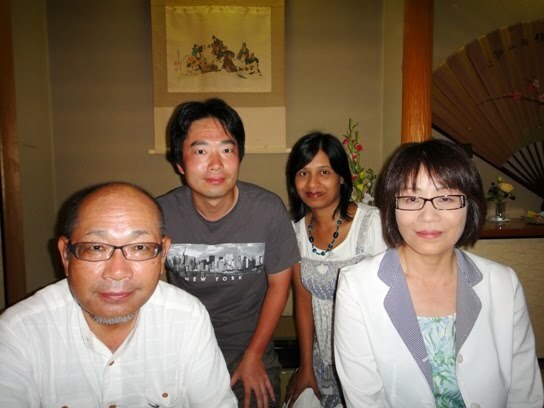 After a long drive of about six hours, we reached back our home in Yurihonjo at about 11.30 pm. 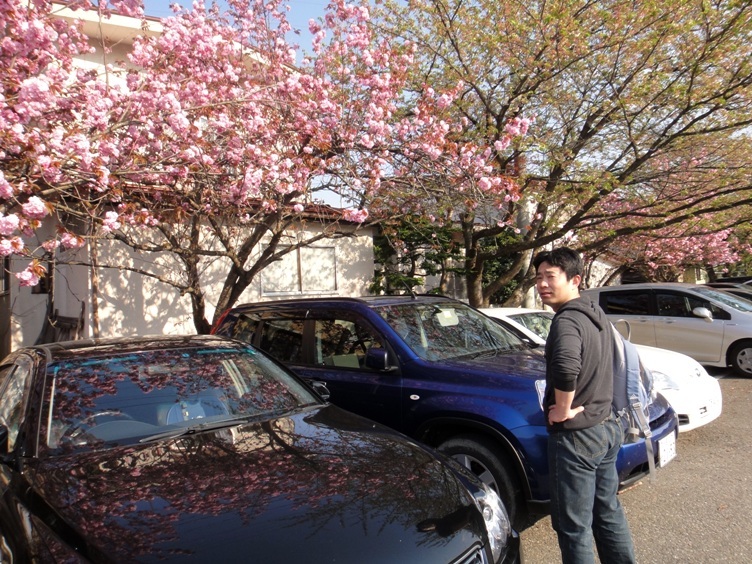 We enjoyed the Golden Week holidays very much.